DECENT PROTECTION AND A CLEAN INTERFACE, BUT THE HIGH PRICE AND HIGH NUMBER OF FALSE POSITIVES DETRACT. Read our F-SECURE SAFE Review. 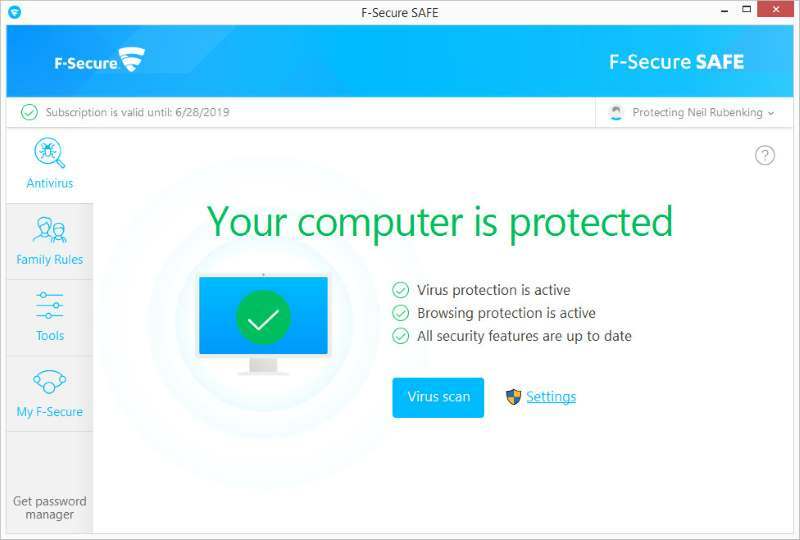 F-Secure makes a return to these pages with its Safe suite, which starts with a package for up to three devices (including Windows, macOS, Android and iOS). That makes it one of the more expensive suites in this test. If you want to cover more devices, then the price rapidly goes up. This level of pricing would be fair enough if the protection was the best on the market, but F-Secure Safe didn’t fare so well in our tests. With a total accuracy rating of 90%, F-Secure Safe was near the bottom of the table and fell behind the free security suites, bar Defender. WHICH ANTIVIRUS SHOULD YOU USE IN 2018? The low total score is mostly down to the way that F-Secure handled the legitimate software. With an accuracy of just 89% it meant a fair amount of good software was blocked by F-Secure. From a user point of view, this heavy-handed approach to security could be quite annoying. That’s a shame, as the core protection proved to be very good, and the software scored a protection accuracy rating of 92%. F-Secure Safe managed to detect all 100 threats, blocked 96 of them, neutralised a further two and let two bits of malware compromise the test computer. That actually puts F-Secure in the upper leagues of the table, beaten by only three other suites. If the false positives could be reduced, F-Secure Safe could be an excellent all-round product. It has a clean and attractive interface that makes it easy to use. The main screen tells you if your computer is safe and has two buttons: one to scan your computer, and one to configure a few options. F-Secure has deliberately kept the options to a minimum, which is a good thing: a security suite should effortlessly protect your computer without having to be configured. Banking protection is built in. When you connect to your online bank, F-Secure Safe shuts down all connections on your computer that the software doesn’t consider safe. That way, other apps are prevented from spying on or interfering with your connection. Next, there’s the Family Rules tab, which is the new home for parental controls. Family Rules is configured through a web portal, letting you configure browsing restrictions and time limits for your entire family. It’s a convenient and easy way of managing your home. For mobile users, Family Rules hooks into the Android and iOS versions of F-Secure, too. Watch out for one major restriction: on iOS, browser filtering works only on the F-Secure browser, not Safari. Click on Tools, and you’ll find that there are few options here. You can adjust the scanning options, view quarantined files, manage which websites are blocked, check for updates and that’s about it. There are none of the extras that other security suites have, such as PC tuning features. That could be a blessing in some ways, and F-Secure’s refreshing and clean approach to security is good to see. At the bottom of the main window is a link for you to get F-Secure’s password manager, Key. The version that you download will work on a single computer, but that’s it. If you want to synchronise your secure passwords across multiple devices, then you have to upgrade to the premium version. Given the high price of F-Secure Safe, we’d expect this kind of utility to be bundled for free. Likewise, a free subscription to F-Secure’s VPN, Freedome, would have been nice at this price. Overall, F-Secure has managed to get a lot right. We love the simple, stripped back interface, which makes Safe feel friendly and easy to use. Other vendors should take note. Sadly, the negatives stack up too. The high number of false positives detract from the experience and reduced the overall accuracy rating. Then there’s the price: Safe is one of the most expensive suites. Our recommendation is to buy Kaspersky Security Cloud instead.